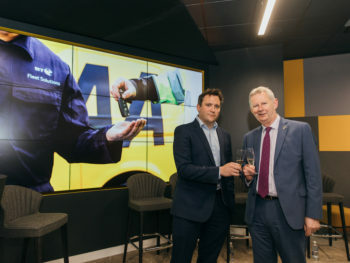 To celebrate almost three decades of working together, the AA and BT Fleet Solutions have held a mini conference at the AA’s flagship training centre and conference facility in Oldbury, marking the signing of a new five-year contract between the two brands. Originally, BT appointed the AA to manage its HGV vehicles, however in 2005, the contract was extended to cover the LCV fleet. Then in 2003, the AA became BT Fleet Solutions’ first external customer. So, the relationship has grown from initial maintenance on the AA recovery fleet to service, maintenance and repair on the 3000+ AA yellow resources. The AA now relies on BT Fleet Solutions to provide fleet management and maintenance services for around 3,000 breakdown and recovery vehicles, and BT Fleet Solutions’ carrying out 40,000 service and repairs for the AA every year, across 65 dedicated garages. The AA also has access to their network of external contractors and specialist repair centres, along with 18 additional strategically located garages and servicing facilities including access outside of normal working hours. Discussions at the event mostly revolved around the findings from the AA and BT Fleet Solutions’ 2018/19 Operational Fleet Report, which indicated high levels of frustration with ‘anti-diesel rhetoric’ amongst managers. The report also explored the future of transport, such as alternative fuels, autonomous and connected vehicles. This report, which was released at the annual Industry Fleet Forum, at the end of 2018, highlighted the fact that more than one third of fleet managers expect to be using electric vehicles within the next five years. However, the majority doubt the sustainability of such models for long-haul journeys or when transporting heavy goods. Instead, seeing cleaner diesel vehicles as a means of improving air quality in the UK’s cities. Using the report as a springboard, a panel of experts, which included Edmund King, AA President; Stuart Thomas, Director of Fleet and SME Services, the AA; Henry Brace, Managing Director, BT Fleet Solutions; Gary Harrison, Head of Engineering at BT Fleet Solutions; and Beth Dawson, Major Projects Manager at Fuel Cell Systems, and were led by motoring columnist and leading low carbon, circular economy and sustainability expert, John Curtis. Topics discussed included the fleet industry’s adoption of alternatively fuelled vehicles (AFV), plus the impact of future fuels on fleets. The panel considered the current ‘carrot and stick’, engagement incentive versus legislation, strategy. London’s Ultra-Low Emissions Zones (ULEZ) came into effect on the 8th April this year, with other major cities expected to follow shortly. The emission reduction scheme currently affects all non-resident drivers travelling through the central London area. In summing up, the panel agreed that, as well as monetary incentives, more education is needed to encourage fleet managers to make the switch from diesel – which remains the fuel of choice for most.